There's a Vietnamese sandwich called a Bahn Mi that's categorized by its meat, coleslaw (made with cabbage, pickled carrots and daikon raddish) and crispy french roll. My first experience with Bahn Mi was back when Eman & I tracked down the Nom Nom truck for dinner in LA one night. I had another opportunity for one in December when I ordered from a San Francisco restaurant "Bun Mee", which was a treat in its own right. Yesterday, I tried yet another restaurant's version, from Café Bunn Mi (I'm noticing a naming trend...). Anyway, theirs was set apart by the ingredients. 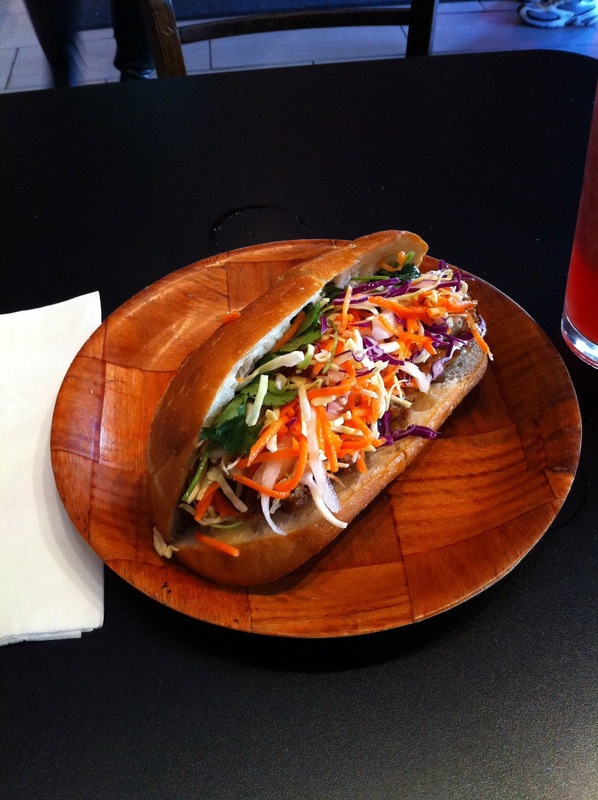 Normally Bahn Mi are made with chicken or pork or maybe beef, but Bunn Mi has one to top them all - a crispy duck bahn mi! Basically the same sandwich, it has lightly breaded duck as the main filling. I took a walk over to the restaurant to try it out during the dry part of the afternoon yesterday (it's been raining most of the weekend up here). I got the crispy duck and a watermelon slush for a drink - literally they put watermelon and ice in a blender, a perfect beverage. Anyway, the sandwich was delicious and I am quite possibly on my way out of the house right now to go order another one. There are so many great little spots right down the street from me it takes a lot of restraint to eat out every day. But to make a long story short, the sandwich was amazing and I can't wait for the next one.